Greetings all. I am a veteran Game Master and web coder with three children on the Autism Spectrum. As I've written before… there are amazing benefits one can gain from Role-playing Games as stated here: Autism & Role-Playing Games. I have also Refereed many Gamma World, Traveller and MegaTraveller games in my day so using that experience I am creating a base for this new Science Fiction game that focuses on good role-playing without the complexities of Rules and drawn out Character Creation. Please note: Only Donations that were specifically carded for this project will be shown here. Therefore, if you want to specifically make a Donation towards FT2 please do select this project as an option. Why Are You Looking For Donations? 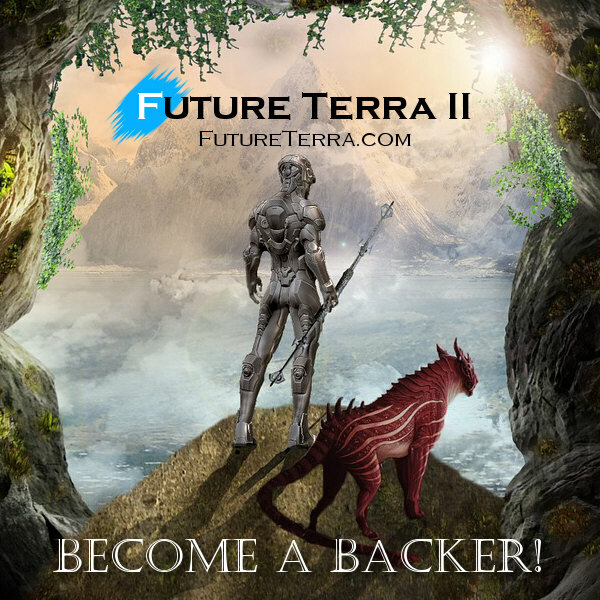 We are starting a new Crowdfunding drive towards the new Play By Post Text Role-playing Game Future Terra II. After the relative success of our Crowdfunding For Ruler of Kings II we were able to create all the major modules for that. Now, we want to do the same with Future Terra II or FT 2 for short but FT 2 will be different. It will take a lot of coding which involves a lot of time so we need to raise funds to cater for that. What Is Future Terra II About? From the Future Terra II Text Role-playing Game General Discussion we will be catering for anyone (Experienced or not) to create a Science Fiction character based on a futuristic world in much the same way ROK II does but without the drawn out process of training and so forth. In other words, during the short Character creation process you will be able to select all the Skills and equipment for your Character in one go so that you can get into the game right away. We envision the process will be fully automated and similar to how it is done when creating a Traveller Character with mustering out as the end result. Therefore, you will get into a story immediately where you choose your Character's background, the skill path, all the knowledge and equipment and then jump into the game with other Player Characters in a Play By Post format. What Makes Future Terra II Unique? There will be no need to to track stats or worry about rolls because the Character Sheet will keep track of everything. Therefore, in a typical Play By Post game a player may want to use a Skill but instead of rolling dice and having to make calculations there will be a button for it so the GM instantly gets your success calculated. This means a GM just needs to tell you the story rather than take on the work of calculation, resolving combat, or calculating experience - that will all be done automatically! Example: After creating your Character you enter a Scenario. The Referee / Game Master will give a difficulty rating for a particular challenge. It is your turn to make an action, you do so saying (More like selecting) you want to use 'X' Skill. There will be a menu for you to select the Skills you have, you simply select it and the roll is made against your Character Sheet. The same will be for combat. You roll and everything is calculated so hit points, armor checks and damage will all be done for you! For this particular project we want to raise at least $3,000 but we will start coding with half that amount. The faster we raise the funds the faster the project takes off. You can test out our latest developed game Ruler of Kings II Text Role-playing Game as an example, however FT 2 only goes up to where you create your Character and then you jump into the game. Where anyone can easily be a Referee / Game Master because the Dice and Skills will automatically be calculated… no one needs to know intricate rules or update their Character Sheet because it will be done for them automatically! Where Can I Ask Questions About This Project? Please use Future Terra II Text Role-playing Game General Discussion. Please make your contributions via our Donate page or the Future Terra II site. Thanks to Anronrosby for being the first Backer for this project. It took us almost an entire year to raise the funds for Armies in ROK II, we hope it will not be the case in Future Earth II. If we can get to $1,500 soon then we can have it coded and running at least and finish all the other frills later when we get our target figure. Please let anyone you know, who is interested in seeing lasting Science Fiction Play By Post Games, about this project. So far, contributions from Mikeyd and Stacia have put us at $48. Remember, any questions about this project can go in the Future Terra II Text Role-playing Game General Discussion Thread. Sorry I could not do more JB but I will really like to see this project take off so we can have some science fiction games on the site again. Plus the way you're talking about how everything will fit together makes it sound totally exciting.